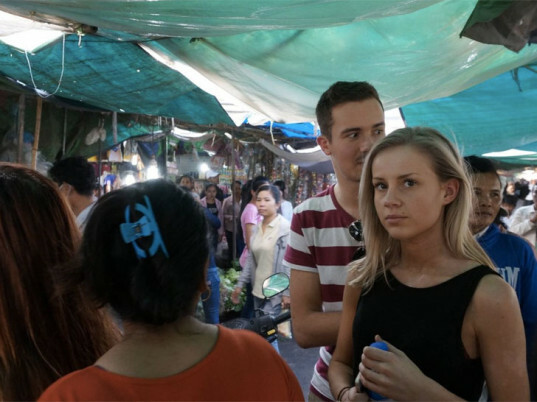 Picture this: Three young fashion enthusiasts from Norway, two of them still in their teens, travel to Cambodia, where they sample the life of a garment worker for a month. Not exactly the most universal of tales, but it’s one that has taken on a life of its own. In the two weeks since we published our original report, the story has gathered more than 124,000 Facebook likes, 29,000 Facebook shares, and nearly 3,000 tweets. Even the deadly collapse of Rana Plaza in Bangladesh in April 2013 didn’t capture this much attention on our site. So what nerve did the lives of three Norwegians touch that the deaths of 1,133 Bangladeshis didn’t? We caught up with Anniken Jørgensen, Frida Ottesen, and Ludvig Hambro to find out. How did you come to be involved in the show? Jørgensen: I was asked because I was a fashion blogger, although I’d describe my blog is more lifestyle than fashion now. Like many teenagers, I was going through a difficult period in my life at the time. I just wanted get away and happily accepted the airfare to do so. I didn’t even look up where Cambodia was on the map. Ottesen: I was curious about what life was like outside of Norway, so when I saw an ad from Framtiden i våre hender (an organization that means “future in our hands”), I sent a video of myself explaining why they should pick me. Hambro: I’m very interested in politics and everything that has to do with society and rights, so my father suggested I apply to become a part of the project. I felt like I was a hypocrite because I knew conditions for workers in the third world were bad, but I still bought clothes. I auditioned for the show because I thought I needed to see it with my own eyes. I wanted to see where my clothes came from and how bad things really were. What was your relationship with fashion like before the show? Jørgensen: I’ve always been fond of clothes, but it has never been my entire life. I’ve always liked to put together things and create something cool. Ottesen: My mother always told me not to buy more clothes than I needed. But whenever I had the money, I usually bought clothes without thinking where they came from. I love vintage and retro styles, though, so I often bought clothes at secondhand stores. Hambro: Before the show, I could easily spend about $1,000 dollars on clothes if I went abroad or even if I went shopping with friends in Oslo. I was a spoiled Norwegian teenager, completely ignorant of the outside world. Most Norwegians, or Westerners in general I think, live within a bubble. We don’t like to think about these things because then we’d have to defend our behavior. Even though we’re told that our T-shirts from H&M or our pants from Zara are made in Bangladesh or other countries in horrible conditions, we kind of pretend it doesn’t happen because it makes us more comfortable. Of course we know it’s not some happy elves in Santa Claus’ factory sewing these clothes, but we still build a wall between us, our immediate world, and what is outside of it. So, is that because we are bad people? No. But we’re giving ourselves excuses and closing our eyes and ears because we don’t want to know. We’d rather skip down the shopping street for the 10th time that year thinking a new pullover will make us happy. What did you expect to get from the trip? Jørgensen: I didn’t have many expectations. I was on the plane, just happy to finally get away. So I had no idea what I was heading into. Ottesen: I didn’t know exactly what I would get out of the trip. I thought maybe we’d meet some garment workers, talk a little to them, and maybe visit a factory, but we didn’t get any information so everything came as a surprise. As a result, everything also had a huge impact on us. Hambro: I expected to get memories and images for the rest of my life, and I did. However, it all got to me more than I thought it would. For the first time in my life, I really dared to open my eyes and see beyond myself and the world I knew. At first, the three of you were pretty dismissive of the garment-labor situation in Cambodia. Was there a specific turning point for you? Jørgensen: It’s true. I think that I was so overwhelmed that I didn’t allow myself to process the situation at the time. I think it’s a human reaction when you experience something so strongly. So I tried to push those emotions away. But after the factory tour, something clicked. I fell into tears and cried a lot that night. I felt terribly stupid and cynical. Ottesen: In the series, there was one line we often repeated: “They are used to it.” But you know what, after coming home from this trip, I’m so pissed with myself for saying that because that is not an excuse! Nobody should live like that even if that was always the case. Nobody should get used to sleeping on the floor. My turning point came after the day at the factory. I sat there for eight hours, sewing the same stitches over and over again. And I only earned $3! That isn’t enough to even buy a Coke! I worked for eight hours and I couldn’t even afford to buy tampons at the supermarket. I realized that, as a garment worker, I’d have to supply my family with food, shelter, clothing, water, transport, electricity, and everything else for only $3 a day. It’s not right! Hambro: I think the two others were a bit more dismissive than I was. Partly because I was a bit older, and partly because I was very into politics, society matters, and such. To be honest, nothing I saw down there came as a shock because things were pretty much what I thought they were like, so in that sense, I was even more ignorant than they were. They genuinely thought conditions there would be better. What came as a shock, however, was really opening my eyes to it in a non-cynical way and realizing that these people are actually just that: people. They’re not machines. They’re not happy elves. They’re people, just like you and me, with a mortgage, with children, with health issues they need to take care of, and they can barely afford to eat. The turning point for me was when I saw how Sokty, one of the workers we met, lived. It was then that I started taking in what it really meant to live as a garment factory worker. The more I saw, the more I felt, and I think it all boiled over after the whole experience: sleeping in Sokty’s house, working in a factory, trying to buy food (conveniently ignoring other expenses they have to count in), and finally going to the women’s center where we had to talk face to face with a garment worker. Jørgensen: There are many who believe that we stayed at a luxury hotel. We didn’t. We stayed at a totally OK hotel most of the time, but it was only to sleep. It wasn’t like we were sunbathing whenever the cameras were off. On the few breaks we had, I either called my family, slept because I was exhausted, or cried. We had to get up early in the morning every day for a new experience, so I would say that we experienced nearly everything. The only difference was that we worked in a pretty nice factory—a family-owned factory. We didn’t get into any others. Ottesen: We had to sleep in a 24/7-secured apartment hotel, because the government and factories didn’t like us traveling around speaking to garment workers and visiting the facilities. We could have been arrested for that, so that’s why we had to sleep in a hotel. But! I think we got a really good look into the workers’ lives, even though I know most garment workers live and work in much worse conditions than we experienced. We slept at the apartment of a garment worker named Sokty and ate dinner with her. We worked an entire day at a garment factory, earned the same wage, and shopped for food at the same market. Hambro: It’s true that we were comfortably housed in Embassy Place Apartment, a comfortable hotel mostly occupied by diplomats and businesspeople. The days were divided up into different experiences of the life of a garment worker. Even though we stayed in a comfortable hotel, we were mostly out all day in areas of Phnom Penh the government doesn’t want you to see. We spent, as previously stated, one night at Sokty’s place. Without breakfast, we were sent straight to a factory and had to work there for eight hours. I had never experienced exhaustion like that before. No matter how comfortable the hotel was, it felt like a lesson itself having to stay there. After witnessing the real life of Khmer people, I almost felt sick about staying where we stayed. I didn’t feel any more entitled to that hotel than the people I had met. I was just born in the right country at the right point of history, thus making me more privileged than them. It felt very wrong. At the same time, if I had to stay any more nights sleeping on the concrete floor at Sokty’s, work any more hours in that factory, or go that many hours without food again, I would have had a meltdown. What was working at the factory like? Jørgensen: I thought they kidding with me when they said we would sit there for several hours. But they weren’t. After seven hours, we went out with $3 in our hands. As I said before, the factory we were in is family-owned, so they had fans and a little more of an “upscale” environment. In the “real” factories, workers don’t even get water or food, because you might spill them on your clothes. The fact that we got lunch was just something they did because we were there, I understood quickly. It was very heavy but, at the same time, I did not understand. When I came out, I told [the camera] that it was fine. That they had chairs, fans, and appeared happy. I was so very, very wrong in the episode, which I understood later in the series. Ottesen: We sat there sewing for eight hours. That was the day that made the biggest impression on me. It was a relatively nice factory because the workers got breaks, they had fans, they got food, and they could talk to one another. They could also use the toilet and drink water while they were working. But it was a small place with only about 50 workers. I met some women who described working in larger factories that employed soldiers with weapons. They only had two minutes to use the toilets, and if they took any longer their pay would be docked. They also described places where they weren’t allowed to eat or drink, or where they were forced to work overtime. It sounded insane and terrifying. Among the labels we sewed for was a sports shop in Paris. 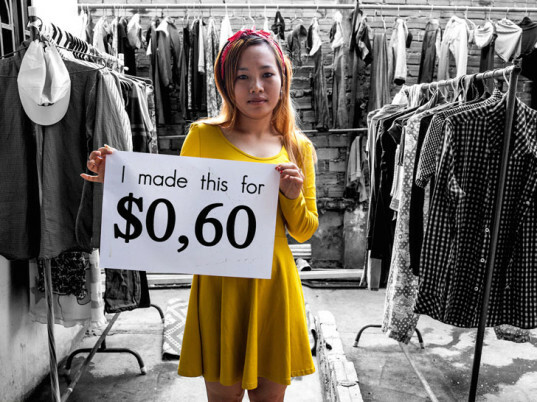 The factory earns $1 per shirt, while the store sells them for $30. That’s the same amount that Sokty pays for her house per month. Hambro: The factory we worked at was a small, family-run business with much better conditions than the massive ones where the big brands manufacture their clothes. The biggest factories are up in the thousands with limited ventilation, daylight. or break times—they’re more like jails than workplaces. Where we worked, there were windows, albeit covered ones, and people seemed less controlled by the factory owner. Many of the workers seemed to be family members. We earned $3 for eight hours of work, which is higher than most other factories, where wages are as low as $2 per day. Despite the relatively “good” conditions, the factory was crowded, the machines were old, and there were no proper chairs. The toilet didn’t flush, and you had to pour water down it from a bucket when you were done with your business. There was no sink nor soap to wash your hands. Because this was a home business, there was a kitchen and workers were served food, in contrast to most other factories. The factory owner lived in the factory, and you could clearly see that his living conditions were almost as bad as his employees’. It’s hard to describe the feeling you get when you have to sew the same line over and over again. When you’re facing an endless pile of textiles, you feel more like a cog in a machine than part of a community. Some people have to sew the same line over and over again for over 10 years—what kind of life is that? Instead of an individual, you’ve become a small part of a machine, mass-producing for the growing overindulgence of Norway and the rest of the modern world. Were there any moments that were cut from the documentary but you wish they had shown? Jørgensen: Many. The girls we spoke with in Episode 5 even told us that they had sewn clothes for H&M. Aftenposten, the newspaper that produced the show, clipped those away, which made me furious afterwards. Ottesen: There was lots of good material that got cut away, but I think the end result is perfect. I can say that because it reaches out to everyone: teenagers and adults. It depicts us as the normal teenagers we are: naive at first, but then filled with new awareness. It’s simple, not too long nor too short, and it gives the right amount of information for viewers to understand that sweatshops are a big problem and something has to be done. Hambro: A scene I think many of us hoped would make it in the show was when we gave Sokty a pack of chocolate hearts from Norway. She cried and said that she had never received any gifts in her entire life. That made us all realize how poor they are. They have just enough to stave off starvation; they simply can’t afford to give or take. Another scene we wish the show kept involved some small children who followed us in the streets of a neighborhood of Phnom Penh. Although they’re deprived of most material goods or other things children in our part of the world take for granted, they still smile and find things to play with. We fell in love with these children, all sharing a bike. We played hide and seek in the street and let them borrow our cameras so they could see themselves for the first time in a picture. They were so happy, despite the grim future that sadly lies in front of them unless action is taken and their parents are granted a minimum wage that properly supports them. They’re starving, and it’s unfair. 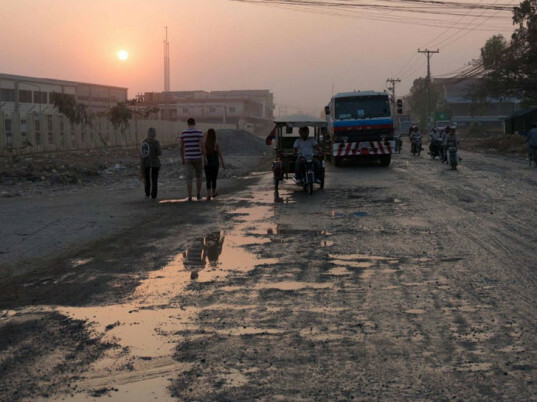 What was the hardest thing you had to do in Cambodia? Jørgensen: When I spoke with the girl from the shelter. I struggle with it even today. At one point I had to stop talking because I could not breathe; I cried so much. Sitting in the midst of it all, I realized that real life wasn’t like news on television. It’s tough to write about it even now. Ottesen: To know that I was going back to my normal life, where I had no problems, no worries, and where I had a good home with a good bed, school, a job where I earned $160 a day—the same as the garment workers received in a month—and everything they didn’t have. It felt so stupidly wrong! Although our lives were so different, we still had the same wants and desires. I was just really, really sad to leave the people I had gotten to know, without knowing what would happen to them. What is your relationship with fashion like now? Jørgensen: I have a different outlook on fashion. I do not buy clothes from H&M because I simply cannot do it. I’m trying to better appreciate my clothes and not throw anything away. It’s important to know that it isn’t the job itself that’s the problem. There are many jobs I wouldn’t choose, like retrieving trash or picking cotton. But that’s life; everyone must do something. The problem [in the sweatshop] is that the air there is bad, the workers sit on a stool, they don’t get breaks, they don’t have freedom of movement or water or food or a proper salary. The workers I spoke with said we shouldn’t stop buying clothes because it means they would lose their jobs. They just want better working conditions, better wages, and better lives. So while I’ve done all that I can on a personal level, the real change has to come from the clothing chains. Ottesen: After all I’ve experienced, I can’t find myself buying clothes at any outlet shops, except when really, really necessary! I actually haven’t bought any clothes since I came back from Cambodia. I started to understand that I had everything I needed. Now I don’t go out “shopping” like it is a hobby, because I think shopping shouldn’t be a hobby. I still love unique clothes from secondhand places, however, or ethical clothing. Hambro: My relation with fashion now is changed. Firstly, I have become much more picky when it comes to clothes, and secondly, I have respect for the clothes I buy. I know that it’s a person with hopes and dreams that has put it together, and that I can afford it because his or her salary is low. Are you campaigning for workers’ rights in any way? Jørgensen: I’m conducting lectures around Norway to convey the message to as many people as possible. But as a schoolgirl, it’s difficult to do everything. I quarreled with H&M in the newspapers throughout the summer last year. I’ve really worked on this issue with blood and tears. Ottesen: Yep! I do my best! I recently spoke at the Norwegian Parliament, where I tried to engage politicians to think about our responsibilities as a country. I also travel to other cities in Norway to urge teenagers and young politicians to be critical about where our clothes come from. (I have four talks lined up right now.) I just want to get people to fight the same fight! Are you surprised by all the media attention? Jørgensen: Not really. It’s only human to respond to [suffering]. This is the world we live in. Human exploitation is only one of the many terrible things that are happening right now. Ottesen: Yes! The fact that Sweatshop got so big in Norway was a surprise. People starting to recognize me was also really surprising. Then the series gained popularity in the rest of the world, and Ashton Kutcher shared the trailer for the show! News outlets from France and Spain have also gotten in touch. We consumers are the ones with the most power, so to hear that so many people care about this problem is enormously gratifying. That means we’re headed in the right direction. I want the future to be a place where I can live with honor, and that can only happen if we all strive together to make it better. Hambro: I’m indeed surprised by all the media attention, but I’m happy the show has gotten it. However, I hope it helps the cause and that all the attention and viewers mean a turning point for this industry. These people need to little to have a proper life; it’s just raw cynicism from big brands and third-party manufacturing companies that prevents it. 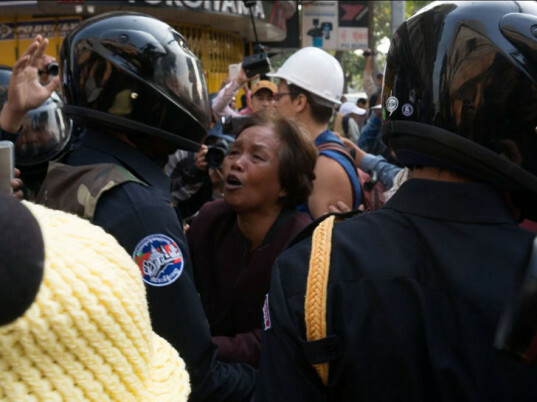 They can’t defend what they do any longer, and I hope all this attention means a change for Sokty and other garment workers. What advice would you give people who want to consume more ethically? Jørgensen: So what should you do? Spread the word; that will terrify the clothing chains into making changes. The fact that the entire world is now beginning to see the episodes makes me so happy. Also, spread the word with friends and family. Show them Sweatshop. If you have a blog, blog about it! If you have Instagram, share a picture! If you’re a politician, make a speech! Everybody should use his or her voice for what it’s worth! Hambro: I think it’s important that we look at the tag when we buy clothes, and try buying clothes from countries with better conditions if it’s possible. 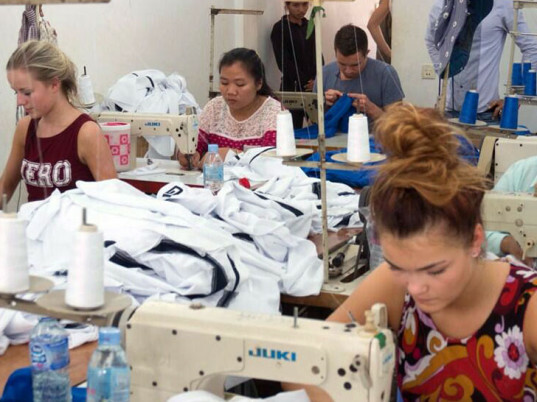 However, it’s also important to keep buying clothes from places like Cambodia because they need the jobs. I think it’s important that we don’t overindulge in clothes. Yes, you can afford to buy a new T-shirt per week, but will it make you happy, and do you really need it when you know where it comes from? The message in Sweatshop isn’t that we should all stop buying clothes; it’s that we have to open our eyes and respect where they come from and the people that made it. It’s to make people open their eyes so we can put pressure on the garment industry. I do think the responsibility lies with the brands themselves. If we paid only $2 more per garment, the wages of these people would double and the industry would still make the same profit. I imagine the CEOs of these brands would still be able afford a nice house or a brand new sports car even if their salaries were cut in half. My advice is this: Don’t stop buying clothes, but open your eyes to where they come from and think twice. Try to do your best to spread the message across the globe so we can make a difference. Aftenposten posted a statement from H&M at the end of the show, even though it wasn’t mentioned by name during the series. Was there a reason H&M was singled out? Jørgensen: Because the workers mentioned H&M a lot but those clips weren’t shown. I ended up arguing with Aftenposten afterwards, too. I don’t know what I would have done without my blog readers. They had my back throughout the ordeal and helped me get the message out. It took a long time but H&M eventually responded. I met with some of the heads. It was a difficult meeting where they didn’t understand a lot of what I was trying to say. They believed that their factories were fine (we weren’t allowed in) and that we were probably misled into believing otherwise. I was so disappointed and angry. Ottesen: They were mentioned because we met garment workers who had made clothes for H&M. Also, H&M is a brand with a lot of power, so they can take the pressure. In the end, H&M agreed to meet me and Anniken. They didn’t want us to film the meeting at first but then we argued a lot and we got our way. There was a lot of tension in the room. We asked H&M a lot of questions, like why they haven’t done anything to improve the situation and why they haven’t used their power to raise wages for their workers. They had an answer for everything without actually answering the questions. Everything was “so hard” to improve because so many people were involved and so on. They also said the show isn’t representative of H&M because we didn’t visit any factories that sewed clothes for them, which was true. They invited us to visit their factories in Cambodia, and I both want to and don’t want to go because they can manipulate it to their advantage. I know that H&M and many other brands feel very threatened by Sweatshop now that it’s gone viral around the world. It can actually be catastrophic for them. The consumer has the power now! Hambro: I think H&M, with their highly educated media-relations executives, will try talking themselves out of this, along with all the other big brands. They claim this documentary is “non-representative” because we didn’t visit any of their factories. The fact is that we talked to their workers. Almost everyone put clothes together for them and that’s one of the reasons for why they were singled out. H&M is also the biggest brand in Norway. I do believe that there are people within H&M who want to make a difference. I’m not saying that they are evil people; I think they just don’t realize what being a garment-factory worker in Cambodia, India, Bangladesh, or China really means. Yes, they do know salaries are too low, they do know something has to be done, but I think they build a wall like I did, and I don’t think they do enough. They might have good intentions and have good words, but actions tell a different story and things aren’t happening fast enough. These are real people—real people who don’t have time for a 10-year process and dialogue. They could be dead by then. I enjoyed hearing the bloggers point of view to see their reasons for joining the show, how their expectations changed, and what they learned. Once you have to be in someone else's position it changes everything you thought and saw. I always want to see the world through another person's eyes to challenge what I think so I can help the world better. 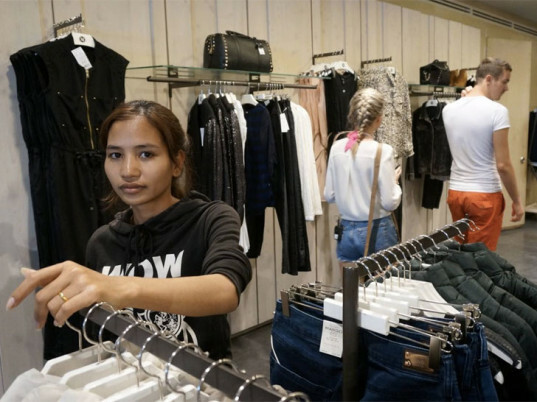 Picture this: Three young fashion enthusiasts from Norway, two of them still in their teens, travel to Cambodia, where they sample the life of a garment worker for a month. Not exactly the most universal of tales, but it's one that has taken on a life of its own. In the two weeks since we published our original report, the story has gathered more than 124,000 Facebook likes, 29,000 Facebook shares, and nearly 3,000 tweets. Even the deadly collapse of Rana Plaza in Bangladesh in April 2013 didn't capture this much attention on our site. So what nerve did the lives of three Norwegians touch that the deaths of 1,133 Bangladeshis didn't? We caught up with Anniken J�rgensen, Frida Ottesen, and Ludvig Hambro to find out.